Motion Vectors Si está habilitado, la línea tiene vectores de movimiento renderizados en el vector de movimiento de textura de la Cámara. Consulte Renderer.motionVectors en la documentación de referencia de la API de scripting para obtener más información. 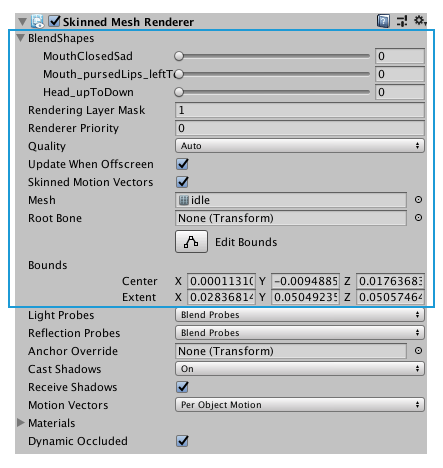 Quality Define the maximum number of bones used per vertex while skinning. The higher the number of bones, the higher the quality of the Renderer. Set the Quality to Auto to use the Blend Weights value from the settings on the Quality window. If the Quality is set to Auto, Unity uses the Blend Weights value from the settings on the Quality window. This allows end-users to choose the quality setting themselves and get the desired balance of animation quality and framerate.